This Bible Study Notebook chronicles Wanda's Bible study on the Armor of God. Over the past few weeks I've kept hearing the above scripture in various context I knew that GOD was speaking to me, therefore I had to be obedient. I don't know what the WAR ahead of me is, but I do know that I must get ready. I used Ameerah's Bible Study printout of The Armour of God and it took me about two weeks to complete. This is my interpretation of this scripture and how I will apply it in my life, as I believe this scriptures must be used everyday and not just during trials and tribulations. You must depend on God and His awesome power, you have to protect yourself by putting on an armor. God gives you this armor so that when the enemy comes against you, you will be well prepared for battle and you will be able to stand strong in your position as an Heir to God's throne, always being ready for Satan and his tricks and schemes. The fight is not going to be against other human beings or against what they are doing or have done to you. This fight is on a higher level, one where the enemy is strong and forceful and unrelenting, it is against an enemy that you cannot fight on your own. It is against an enemy who knows your weaknesses and is ruthless when it comes to defeating you. He will not stop until he wears you down or defeats you. He is such a strong force that he can be found even in heavenly places. However God has given you some armor to protect yourself from the enemy, you MUST wear EVERY piece of it because you will need every piece of it when you are being attacked, Once you use every item given to you by God you will be standing strong when the war is over. The first defensive weapon in your possession is the Truth, it is liken as a belt because it holds everything together. Allow the truth of God's word to be the foundation on which you stand. The truth will hold you up and set you free. Knowing WHO you are and WHOSE you are in Christ is the first truth you need. You are God's Child, and you are just as important to Him as His son Jesus. You are loved completely by Him and because of His love for you, you are free. 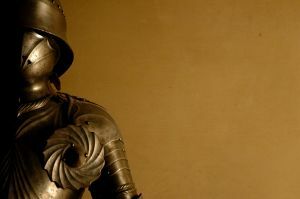 The breastplate is the largest and the next most important piece of body armor, because it protects your body. This body armor is likened to God's righteousness. Because of His righteousness you are well protected during this war. His righteousness gives you good standing ground and protects you from anything the devil will try to throw against you. The body armor of God's righteousness allows you to look at your situation and circumstances through God's perspective. The devil will try to show you every situation and every circumstance that goes against God's plan for you. When you start to dwell on these things you will lose your focus of God's promises for you and may let your guard down. God's righteousness reminds you that He has righted every wrong in your life, He has given you His seal of approval that you are His child and that He loves you so much that He sent His only begotten son to die for your sins and to conquer sin and death. Using God's armor of His righteousness sets you above all the tricks and schemes of the evil one. To stand firm during the battle you must wear comfortable shoes. You must be so comfortable and at peace with God's word and in the power of His good news that you must wear that Peace like you would wear your most comfortable shoes. Once you are standing in the peace of the Good News you will be ready for anything that comes your way. This peace fills your soul when you give your problems to GOD. It is the same peace that the Bible says "Passes all understanding". It is a surreal feeling that everything is being taken care of and that you need not worry about anything. When you are being attacked you will need a shield to stop the wicked one from getting to you. You must use your FAITH. Faith is your deep surety within yourself that GOD is with you, that even though you cannot see Him, you know that you know that you know that He is for you and that no matter what you might be seeing in the natural/flesh that He is fighting the battle for you. So when Satan tries to trick you into looking at the situation or the circumstance, you must keep your eyes focused on Jesus and His promises for you. The fact that you are saved is going to be a vital part of your protection against the enemy. It will protect you like a helmet protects the head. When you gave your life to Christ He gave you the gift of salvation, which is His promise that you are saved, a brand new creature in Christ. You are His child and He will be with you through all eternity and one day you will be in heaven with Him. Salvation is deliverance from all sin, safety in God's arms and preservation to live in eternity with GOD. God's Word is the most powerful weapon that you have been given. In order to use this weapon you must be familiar with it. You must READ it, MEMORIZE it, SPEND TIME in it, STUDY it, SPEAK it, Pray it and most of all believe in it. Using it like a sword it can cause you to defeat the enemy. It is a very important weapon and it must be used to defend yourself. God's word is powerful. along with knowing it you must speak it over your situation, you must also pray it back to Him, reminding Him of His promises to you. His word will not return to Him empty. If He has said it in His Bible He will manifest it in your life. USE GOD'S WORD, it is fundamental to you winning the war, you are hopeless without it. When you pray God's words allow the gift of the Holy Spirit to be alive in you. It is found in the scriptures "Pray without ceasing" THEREFORE YOU MUST BE PERSISTENT, never give up on the power of your prayers. God Loves it when you talk to Him. He loves to know that you are turning to Him for everything. Believe in the power you have in prayer and use it. The battle is won when God and His word do the fighting! Will you be prepared when the enemy looks your way and decides to attack you? Is there any sure fire way to win the battle without breaking a sweat? Are you going to put your FULL armor of God on everyday or are you going to wait until the battle is right in front of you? PREPARE NOW....The Battle is NOW.... Everyday you are in a war and if you are ready for the battle you can NEVER lose. Heavenly Father, You love us so much and yYu know that the day will come when we will have to fight the good fight. You have prepared us by giving us all the defensive armor that we need and You have given us the offensive weapons of your word and our prayers. Help us to prepare everyday to win against the one who comes to steal kill and destroy. We are depending on You to win this war for us as we stand still and watch You fight the enemy for us. Help us to appreciate the protection You have given us and to use it, we depend on You alone for the victory. This is a great study Wanda. Thank you so much for sharing it with us. I am sure it will bless a lot of people!